I just go bonkers over such intact rooms, and at the same time fear that the new owner will tear out all this beauty to “update” the house. Let’s all pray for this Spanish/Deco treasure. 8 Responses to Wanna Freak Out? I’m remembering that stupid House Hunters episode…or some HGTV show like it where this young woman purchased a similar home for the “charm” then had her contractor rip out the lovely original kitchen. WAVE THAT MAGIC WAND! Ack. 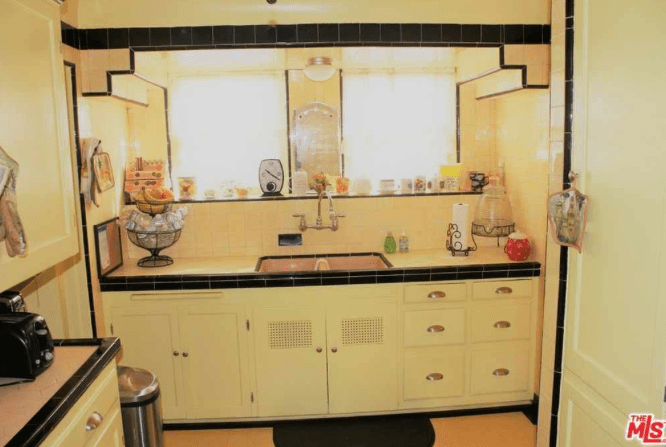 This is where I may get kicked out of your blog….. I’ve lived with that style, and it was a nightmare. 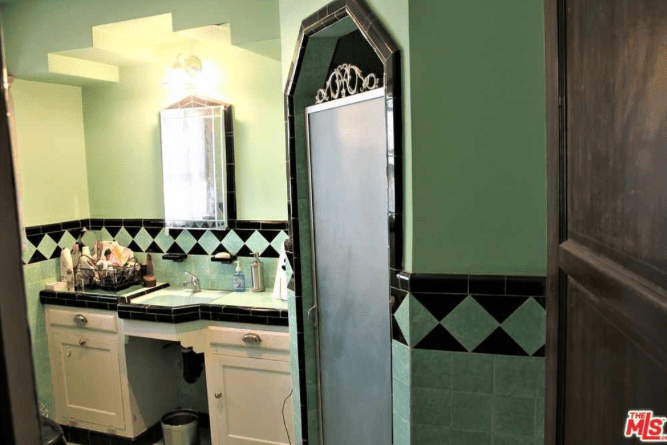 The grout is impossible to keep guck free, the tiles are rarely level, so bottles tip over, and ….ugh who knows what is under those drawer pulls, especially in a bathroom. An ocd’er’s nightmare. A flat all one material counter is much more practical, hygienic, and functional. On a positive note, I can appreciate the tile work framing the walls and the backsplash. I would leave that alone. Are you planning on putting something like this in the Cross House? I’d cry a little bit. I never kick people for differing opinions. No, I am not planning to install a Spanish/Deco kitchen in the Cross House! I think it is fine that you dislike such counters and stuff. Just promise me never to buy a house with such features and tear them out? Duly noted about the car tires, and deal! I will not buy such a house! Absolutely stunning, I’m a sucker for Art Deco. Fingers crossed all that home’s owners will feel the same way! Currently, I am sanding an old armoire that belonged to my grandmother who had it from her great aunt and who must be 125 years old. This armoire has always been in the summer kitchen that has never been heated and used as a storage for various items. I gently removed the handles and hinges and rubbing them with a brush I noticed that 3 handles were the same and 1 handle was similar but not identical. The two handles of the drawers are similar but not original because there is a hole under the handle. The cabinet has 4 doors and 2 drawers. The exterior is varnished and has very dark moldings. The interior is coarse and bleached. I do not sand the inside because I want to leave a little original.